Gaudiani Clinic is a specialty and primary care clinic in Denver and provides expert outpatient medical care to adolescents and adults of all genders with eating disorders, disordered eating, or a history of an eating disorder. What is the Gaudiani Clinic? The Gaudiani Clinic is specifically designed to meet the needs of its clientele. It is a place where, under the care of Dr. Jennifer Gaudiani and Dr. Elissa Rosen patients can expect superb internal medicine care provided in a comfortable and highly discreet private practice setting. Members of the Gaudiani Clinic will have access to state of the art, evidence based, multidisciplinary care. Once an initial consultation has been scheduled, prior records, if available, will be thoroughly reviewed, and detailed communication with current treatment providers will have taken place. The initial evaluation will consist of, but is not limited to: blood work, EKG, vital sign evaluation, and a full physical exam. In the comfort of our warm and inviting office, patients will have an opportunity to have a long conversation in which they can share their full story, ask questions, review findings, and collaborate on a plan of care. Whenever needed, the Gaudiani Clinic staff will swiftly coordinate other needed medical services such as radiographical studies, procedures for diagnosis or risk evaluation, and referrals to sub-specialist physicians such as a gynecologist, gastroenterologist, cardiologist, or endocrinologist. By the end of the first visit, patients will leave with prescriptions for needed medications, and a thorough understanding of their current status and plan of care. If continued care at the Gaudiani Clinic is desired and appropriate, patients will have the opportunity to become a member of the clinic where they will be able to continue to receive expert medical care from our expert medical team. At the Gaudiani Clinic, patients will receive evidence-based diagnosis and treatment of the medical complications that arise from caloric restriction, purging, and binge eating, all addressed in the context of the whole person, body and soul. The state of medicine today unfortunately often silos body problems to be cared for by one set of doctors, and emotional problems to be cared for by another (totally separate, often not communicating) set of providers. Our expert medical team believes strongly in a whole-person, team approach, and the clinic will offer state of the art medical care. Additionally, patients with disordered eating may have a variety of other medical issues, such as irritable bowel syndrome and suspected food intolerances, that cannot be adequately treated without concurrent treatment of the food issues. There are no weight or level of illness criteria to join the Gaudiani Clinic. The Gaudiani Clinic will provide expert medical care to adolescents and adults, with disordered eating or eating disorders, of all shapes and sizes. You might have had anorexia nervosa five years ago and need someone to follow you for your annual exam, who can also evaluate how your bone density and digestive systems are doing. You might be on the brink of being diagnosed with an eating disorder and need someone to sort out which medical problems arose from disordered eating, and which ones contributed to disordered eating. You might have been hanging in there with an eating disorder for years and finally want to try and overcome it. You might want a doctor who can think about harm avoidance strategies with you if you’ve had an eating disorder for decades and hope for a better quality of life, but don’t think full recovery is in the cards. Or you might have a bunch of confusing medical things going on, and think you need a higher level of care, but aren’t sure how to find a program that truly matches your individual needs and want guidance. We are confident the Gaudiani Clinic can support you medically as you begin, continue working towards, or remain in your life recovered from an eating disorder. 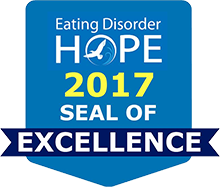 We believe it is possible to recover from an eating disorder.